O heck yiss. This is best snek. 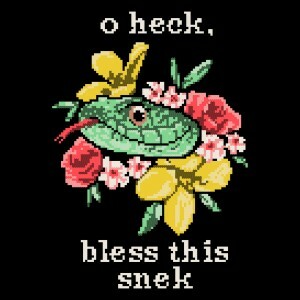 Can you believe some people don’t like snek? People think snek scales are slimy, but no. They are soft like smooth rock. Like gem. Like green, shiny gem. And snek just wants to hug, not bite. Hug with whole body instead of just arms which he doesn’t have. Snek is a good. Plz let snek into your life and have a good day. Also plz wrap this cloth around your torso because snek.